The Florida Gators recruiting efforts finished the regular season strong with a huge win over Michigan and the coaching staff is now looking to finish off the 2019 class strong. Mullen and his coaching staff welcomed nine early enrollees on campus earlier this month and they have their sights on finishing the class strong. Gator Country’s members have a lot of questions about how the 2019 class will shake out and who are the top prospects that the Gators are still after. We answer your questions in this week’s Florida Gators recruiting mailbag. Ebuck11: Is it more fun for you these days to answer the recruiting mail? AS: The mailbag has always been something I’ve enjoyed but bringing you guys good news is a lot easier as you guys aren’t as upset about things lol. Gatorntuscalossa: Realistic guess at how many commits pop this weekend at Junior Day? Thx. AS: I would say 2-3 guys commit this weekend. Gatorfantm: Do you think Carson Beck flips on Junior day or will it be a longer process? AS: Beck says he wants to visit Miami on Sunday so it looks like he will let his process play out a little bit after he visits Florida on Saturday. Irgator12: How do u feel about Mullen’s strategy for the NSD part deux. All official visits on one weekend and then going all out on the final in homes with Elam and MAR? AS: Mullen wanted to set the bar high and that was his plan. I’m not sure it would have made much of a difference of when they visited Florida or when he visited them with those guys. Moore had never been on campus yet so you needed to get him on campus early and Elam and Richards had been on campus a lot so it didn’t matter as much when they visited. 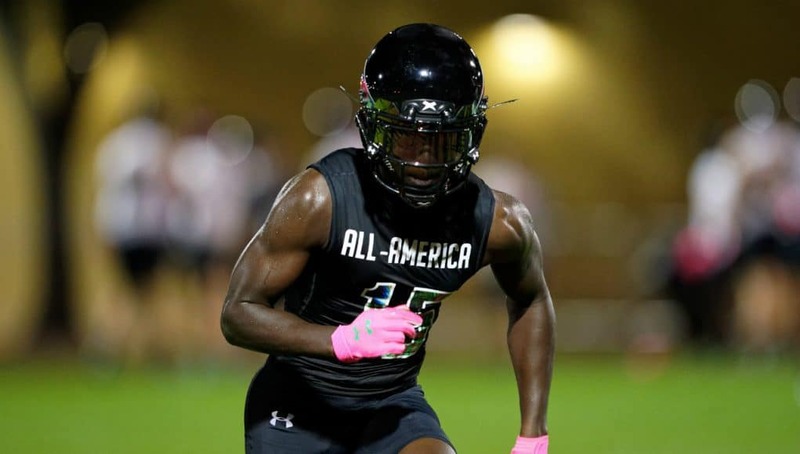 Gatorfantone247: Out of khris Bogle, charles moore, Mark anthony richards and Kaiir Elam who do you think we land? AS: I feel good on Florida’s chances with Elam right now. After that I think Florida has the best with Richards then Bogle and lastly with Moore. Bogle is a wildcard as his recruitment is far from over and we’re less than a week away from signing day. Gatorfantone247: Any updates on Fred Davis and miles brooks visiting this weekend for our junior day event? Have there been any new names added to the list? AS: Neither of those guys have confirmed either way yet but we will continue to monitor that. Right now the list is updated with the latest names. Shade45: How are defensive line recruits responding to the Coach David Turner hire? AS: Guys seem to like him a lot early on and they say he has a lot of energy about himself. Turner has a resume that also relates well with these kids as well. Graylon: What safeties from the 2020 class are trending for us? AS: Florida already has Rashad Torrence committed in the 2020 class and they’re after RJ Mickens and Avantae Williams hard. Williams is former teammates with Dionte Marks has a lot of interest in the Gators despite his Oregon commitment. IAmBornAGator: Numbers are getting tight if we are favored for Elam, ahead of others for Bogle and in the hunt for Moore, then there is MAR all have committable offers I would assume. Add in interest in several grad transfer OL so just how many can we take? AS: I don’t expect all of those guys to choose Florida but grad transfers in the spring can be added after some guys transfer out in the spring. Macbgator: Which 2020 recruit will be the leader to get other recruits in the class,” the cowbell”!! AS: Leonard Manuel is a big recruiter for Florida and several of the 2021 guys are also big recruiters. Kamar Wilcoxson is a big one for 2021 and Gervon Dexter is also playing a big role in the 2020 class. Gatorchamps0607: Are all remaining targets announcing on TV on NSD? Or could any of them commit at any time? AS: I expect the rest of the targets to wait and announce on signing day next Wednesday. Supagator: I know it’s early but….. How many do you think we’ll take in the next cycle? AS: Florida has 17 seniors next year and a few guys that could leave early so take that in to account plus there’s always transfers. Florida should be pretty close to being take 25 again next year. RVG: How many players do you anticipate transferring after spring football, and how does it affect 2020 and 2021 recruiting? Does Coach Dan Mullen have an idea who is leaving and is already scouting to fill those roles or is it more fluid than that? AS: I don’t have an exact number but almost every year a couple of guys transfer out simply because they either don’t fit in with the scheme anymore or don’t see playing time for themselves. It doesn’t really affect the 2020 and 2021 classes but it could force them take another player at another position if the numbers get low. Mullen I’m sure has some sort of an idea of some guys that could leave but nobody has exactly decided they’re transferring or they would’ve announced by now. Sgjordan88: Where do we stand with Charles Moore, after his final OV’s? AS: Right now, I would say Moore is heading to Auburn as they’re the team that has been recruiting him the longest and the longer he gets away from his official visit to Gainesville the better Auburn’s chances look. Juggernautz: What’s your take on Demarkcus Bowman? AS: Bowman is one of the best players in the country for next year but Florida is right there as being the favorite for Bowman. Clemson offered this past weekend and Bowman likes them a lot but the Gators will be tough to beat here. Dkinggator: Do we have Plan B’s for Mark-Antony Richards, Charles Moore, Khris Bogle or Kaiir Elam should we miss on one or all of them? Or do we just wait till next year? AS: Mullen feels good about Florida’s class already so he isn’t going to reach for anyone, he will simply just save the spots for next year or for transfers. Routerhead: Are we out of the running with Nathan Pickering, or is he still a possibility? AS: He hasn’t officially eliminated Florida but the Gators have the slimmest of slim chances here. Mississippi State or Alabama looks to be the final place for Pickering.